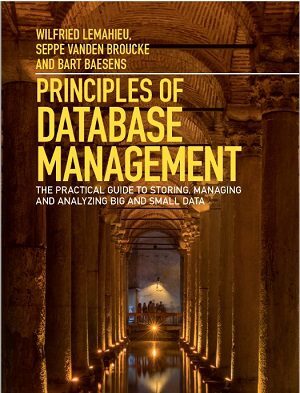 This comprehensive textbook teaches the fundamentals of database design, modeling, systems, data storage, and the evolving world of data warehousing, governance and more. by Lemahieu W, vanden Broucke S., Baesens B. A solutions manual with the solutions to all multiple choice and open questions available to instructors. An online playground with diverse environments, including MySQL for querying; MongoDB; Neo4j Cypher; and a tree structure visualization environment. You can log on with user: demo and password: demo. The playground can also be downloaded as a Dockerfile. If interested, you can order an inspection copy here.